Phantom Breaker ファントムブレイカー was one of the games that I was personally looking forward to, but the release was cancelled in North America. However, it would appear that a side-scroller “Beat em’ up” game by the name “PHANTOM BREAKER: BATTLE GROUNDS -Cocoa’s Nightmare Attack-” was going to debut in its stead as a spin-off of the series, I knew I had to grab this game. Unfortunately, we will probably never see a North American release of Phantom Breaker in its full fighting game glory; but that does not change the fact that I am still hype for what PHANTOM BREAKER: BATTLE GROUNDS aims to be and a beat em’ up style game with fighting game properties could prove to be amazing. Go ahead and hit the jump to catch the full review! 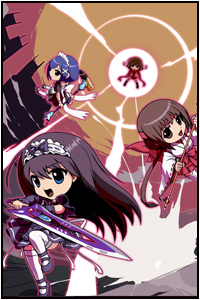 Title: PHANTOM BREAKER: BATTLE GROUNDS. Release Date: February 27th, 2013. 03. Story Mode Synopsis & Impressions. 05. Combat, Enemies, & Bosses. PHANTOM BREAKER: BATTLE GROUNDS -Cocoa’s Nightmare Attack- Opening Animation. Because this game is available for the Xbox Live Arcade, you will need to head over to the Xbox Marketplace games section in order to download it. When you go to download it expect a 1.56 GB file, that lets me know this is probably a pretty extensive game. Once the download completes and you load it up, you will be greated with a “Now Loading” screen (Reminds me of the old Playstation days) and the sprite of one of the characters will be shown beside it (Mikoto). 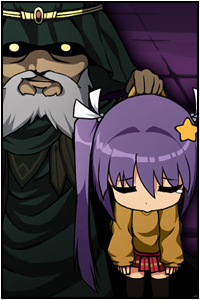 Following this you will see the ESRB rating of “E” for “Everyone”, the Xbox Live Arcade logo, and the typical warning that this game performs “autosaves” (Meaning that it will save itself automatically once certain checkpoints are reached in-game), afterwards the Mages, 5pb, and Division 2 logos are given before an intro starts. Then the intro which is pretty neat, is done in anime style with the chibi-esque characters. The intro shows off our protagonists wanting to save their friend but unable because of the hordes of enemies standing before them. Afterwards we are given an introduction to each of the four starting characters: Mikoto, the Sword Master; Waka, the Shrine Maiden; Itsuki, The Ally of Justice; and Yuzuha, the Ninja Girl. After the opening animated introduction, you are taken to a “Press Start” screen with the PHANTOM BREAKER: BATTLE GROUNDS logo behind it, after pushing start you will be taken to the Main Menu. The Main menu is pretty neat, it has an 8-bit style to it as far as the font goes and a moving background that is stripped with blue and a greenish-blue along with various white circles featuring the character pictures of our heroines. Next, I select “Play Game”, select, “Local Game”, and then select “Story Mode”, select Mikoto (I mainly select her because she reminds me of my main “Yui” from Vanguard Princess with that oversized sword!) and select color #01. I then choose to begin on Stage 0 Akihabara, and now we are ready to roll! These are all the selectable options that are available from the Main Menu of the game after the opening animation has ended. Play Game – Upon selecting this you will be greeted with three options: “Local Game”, “Xbox Live Game”, and “Skill Set”. The “Local Game” option is for offline play, giving you the ability to play in either Story Mode, Arcade Mode, Co-op. Mode, or Battle Ground Mode. “Xbox Live Game” will you give the ability to play Co-op. Mode or Battle Ground Mode online through Xbox Live. Finally, “Skill Set” which allow you to allocate skill points to a character in order to increase their Attack, Defense, Speed, or give them new abilities. Leaderboards – This shows you the top placings for the listing of Arcade, Co-op. Mode, Battle Ground, Battle Ground Weekly, Arcade Weekly, and Co-op. Weekly. Also, has different filters for selecting exactly what you want to see: Everyone, Friends, and My Rank. 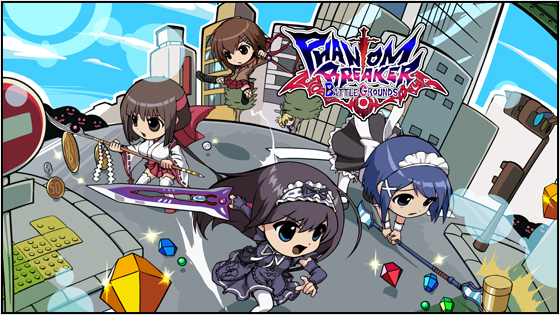 Achievements – Immediately opens up the achievement list for PHANTOM BREAKER: BATTLE GROUNDS. (400 Gamer Score Total, 100 with the Kurisu DLC). Help & Options – Upon selecting this, you will be greeted with four options: “How to Play”, “Controls”, “Settings”, and “Exit”. “How to Play” is a 26 page long instructional guide on everything you will need to know about PHANTOM BREAKER: BATTLE GROUNDS. 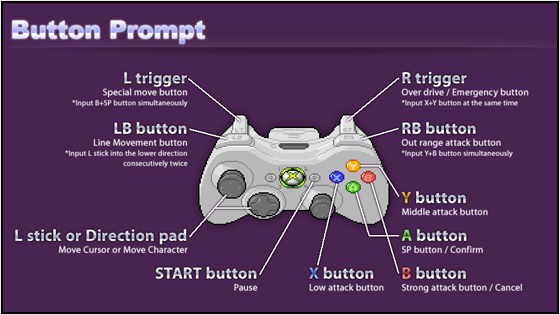 “Controls” is a outline of the control scheme on the Xbox 360 controller. “Settings” is an option for “BGM” Volume (Background Music Volume), “SE Volume” (Sound Effect Volume), “VO Volume” (Voice Volume), “Storage”, and “Exit”. Download Content – This option will immediately take you to the Kurisu Downloadable DLC on the Xbox Live Marketplace. Exit Game – Exit PHANTOM BREAKER: BATTLE GROUNDS and return to the Xbox Dashboard. The story surrounds a mysterious man named “Phantom”. His powers are sealed away and he is currently plotting to gain his powers of darkness back. Phantom plans includes giving young girls with supernatural abilities armour infused with F.A (Fu-mation Artifact), promising to grant their wishes if they were to win battles. However, what they do not know is that the attacks and weapon clashes while wearing F.A disrupts space-time and weakens the seal keeping of this world and another, slowly allowing Phantom to regain his sealed powers. There is a family known as “Kumon” who protects the world against the evils of people such as Phantom. Two girls, Mikoto and Waka (A girl who is a descendant of the Kumon) decided to help stop Phantom’s plot, but everything takes a turn for the worst when he escapes and kidnaps Waka’s younger sister Nagi in the process. Soon they are joined by two other girls, Itsuki, a maid who considers herself an ally of justice, and the ninja girl known as Yuzuha who was unpersuaded by Phantom’s promises. The four girls soon set off on a mission to protect the world from the darkness of Phantom and rescue Nagi before it is too late. To begin with, I really like the way they put this story together. You come across yourself various times to show that a copy of yourself exists in worlds parallel to your own and that sometimes they do not work for the best of intentions (Such as in Mikoto’s story). While this game does not have a very deep storyline, it does have decent dialogue and effects at the end of stages that is grand enough for you to get pulled in and want to see what happens next. As the game progresses you fight others who seem to be under the control of Phantom, some because they have no choice and others because they like the power that they were given, contrasting elements that make up the whole of this game. Something else well done in this game are the backgrounds and scenery you will be fighting in. If it is on the street, a demonic realm, or even the inside of a building, you feel like drawn into the locales. Out of all the beat em’ ups I have played, this tops them all, including Scott Pilgrim vs The World the Game. All while doing its best not to repeat itself too much as far as repetition of the environment as stages goes on, as it appears that they have 2-4 back drops per level, and there are 8 levels to choose from. So, all-in-all Story Mode is pretty fun and enjoyable, the little sequences (Including the ending animation) and dialogue brings you into the world of PHANTOM BREAKER: BATTLE GROUNDS. The only problem that I really see with this story is that you are working towards saving Nagi and not actually defeating Phantom (Which does make a few cameos during the course of Story Mode), as he would have made an excellent final boss (Because he is the one who originally took Nagi and his gigantic size in relation to the rest of the characters, since this game is missing a “Massive Boss” type character). 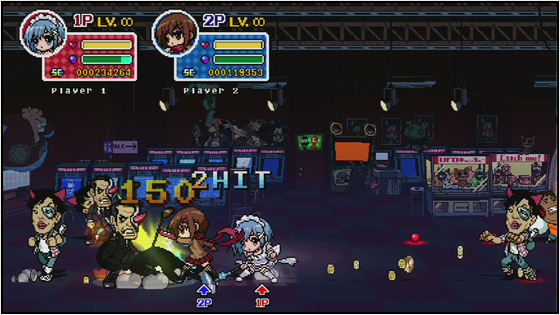 PHANTOM BREAKER: BATTLE GROUNDS actually features a pretty robust moveset and advanced fighting mechanisms that make full use of everything your Xbox 360 controller has to offer; not to mention the fact that a lot of the mechanics in the game have a very distinct fighting game feel to them. The Basics: LT is your Special Move button (B+A), RT is your Over Drive / Emergency Button (X+Y), LB is your Line Movement Button (Or double tap up/down), RB is your Out Range attack button (Y+B), Movement is either the Left Stick or D-Pad (I personally recommend the D-Pad), X is your low attack, Y is your Medium Attack, B is your Strong Attack, A is your Special Move button. Advanced: You are able to also perform the Dash Attack (Perform an attack while running, different for Weak, Medium, and Strong Attacks), High Jump (Push down and then up, similar to a Super Jump from Ultimate Marvel vs Capcom 3), Double Jump (Allows you to jump once more in mid-air), Air Throw (Gives you the ability to air-to-air throw an opponent. ), Combo [Lvl. 1~2], Guard Cancel (Allows you to Guard Cancel into either a Special Attack, EX Attack, or Phantom Break) , Counter Burst [Lvl. 1~2], Critical Burst (A Counter Burst which slams your opponent against the ground and wall, uses 200% Critical Gauge), Special Attack [Lvl 1~2], EX Attacks (Powered up Special Attacks, requires 100% Burst Gauge), Over Drive [Lvl 1~2] (Puts you into a high speed state where you have super armour as well, slows down opponents and consumes all Burst Gauge), CD Cancel, and Phantom Break (Ultimate Attack, uses 200% of the Burst Gauge). A lot of these mechanics are very cool to use, for example: While using Mikoto, you can do Down+A for a Shoryuken like move, attack with Y while in the air and then cancel it into a Double Jump and attack with Y then Forward+A for a Special Attack; or while playing with Cocoa do her grounded X,X,Y,Y,B,B,B,B Forward+A. Not to mention doing things like pushing Forward while blocking to do a Red Parry, similar to Street Fighter III: Third Strike and then attacking your opponent. A lot of these mechanic would be incredibly fun to use in-game, but they did not do a very good job of telling people exactly how to use all of these mechanics in an easily accessible place. For one, when you increase the skill of during the “Skill Set” option, they should tell you exactly how to perform the move (Such as the CD Cancel). Besides that one little thing, which can be figured out on your own, the mechanics of the game makes it really enjoyable. Falling in love with this game is rather easy once you experience the rather enjoyable combat featured in this beat em’ up. 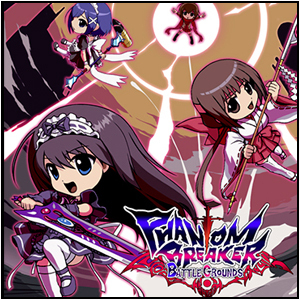 Phantom Breaker: Battle Grounds takes a rather old and nearly forgotten genre and makes it feel more fresh and vibrant than it has in years. While it does not attempt to reinvent the wheel, it makes dramatic changes to typical fighting by use of its advanced control scheme (See the Control & Mechanics section). The result can only be explained as combo madness and beat em’ up goodness. A lot of times you will find that many enemies populate the screen simultaneously and you have the ability to hit as many characters as your weapon can possibly touch, making for some pretty chaotic battles (I can even remember one time fighting a group of large T-DA Monsters and my character was not visible on the back row, I had to line-jump to make her visible!). You will find that your hit counters can easily go up to 200+ HITS when performing the Out Range attack at 200% burst. So, with that being said, the combat is very well done. While it is hard to take advantage of some of the mechanics (Like pushing forward to parry an attack, for example), even general button mashing makes you feel like you are doing a lot from the calamity that is going on with the screen. You have different types of enemies you will encounter as stages go by. The Kagebito, T-DA Monsters, Robot Crops of Wahrheit, The Ying Yang Fortune Tellers under Phantom, and various Bosses (Such as a Dragon or Oni, and Sub Characters like Cocoa or Infinity). The enemies in this game are especially fun to fight and are not really annoying (Except for the Ying Yang Fortune Teller who uses the tracking explosion jutsu, that one room in Stage 6 – Demonsphere, nearly killed me), and I find that the bosses are very fun and actually feel like bosses. You will encounter your typical punching bags, ranged attackers, heavy slugger, even those on motorcycles (Reminds me of Streets of Rage 2), only thing missing was someone who primarily only grabs or runs away (Thankfully the latter did not exist). Despite some of the other beat em’ ups that have released on the Xbox Live Arcade over the years (Scott Pilgrim vs The World the Game, Castle Crashers, Guardian Heroes, etc.) I think you will find that this one takes the cake as far as combat in concerned, hats off to the creators. Available already is the DLC pack for “Kurisu” from “Stein’s Gate“. This will make Kurisu playable in Arcade Mode, Co-op, and Battle Ground modes. Also, it will raise the level cap of all characters from 50 to 99 to better help beat this game on even the hardest difficulties (And trust me, it gets hard, even with 4 Player Co-op). The price for this DLC is 400 Microsoft Points and will tack on achievements worth 100 Gamer Score. Also, it should be noted that if you download this DLC you will not be able to play with other players online who have not purchased it as well. The only problem I have with this is not being able to play with players who do not have it, where as I think they should probably release a patch so that you will be able to do so; but then again, if your character is now Level 99 and someone else is maxed out at 50 it would not make much sense, so I guess they did the right thing. Here is the for it on the Xbox Live Marketplace. Kurisu Pack. You can check out the trailer below. 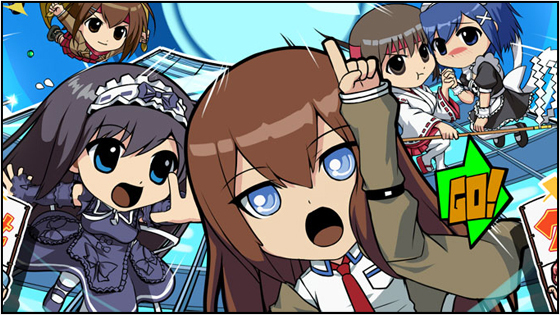 Kurisu Pack Trailer expansion for PHANTOM BREAKER: BATTLE GROUNDS. YES! 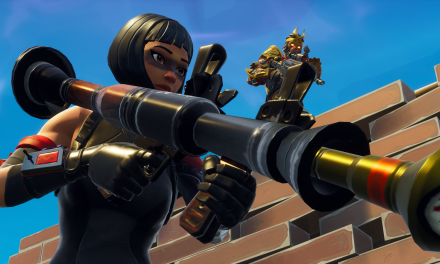 THIS GAME IS WORTH BUYING! Strengths – Solid beat em’ up with chaotic combat, impressive 8-Bit Music and Art, makes great use of fighting game mechanics and burst gauge mechanism to govern special functions, and it is only 800 Microsoft Points for all this goodness. Weaknesses – Story Mode ends in an anti-climatic fashion and it is hard to find an online match in both Co-op and Battle Grounds (Both a problem if you do not have a friend with the game and are going for a perfect achievement score). Wrap It Up – Honestly, PHANTOM BREAKER: BATTLE GROUNDS has grown to be one of my all-time favorites game releases for the Xbox Live Arcade, standing amongst the ranks of Hardcorps: Uprising and Marvel vs Capcom 2: New Age of Heroes). I think everyone who enjoys old school beat em’ ups with a new generation anime flair will positively fall-in-love with this game. The light-hearted characters, the awesome 8-bit music, sounds, and artwork, including the amazing back drops and scenery. Top notch fighting and flair, mayhem and crazy four-player co-op and free-for-all (In Battle Ground mode) makes for one of the best Arcade Games to hit Xbox Live in my opinion because it has tremendous replay value if you plan on leveling up all characters to 99. While the ending felt pretty premature and anti-climatic in Story Mode since you did not have to fight Phantom, the game is still fun beyond a shadow of a doubt (However, it turns a “Great” game into a “Good” game, think about the ending to Mass Effect 3). It is my recommendation that this is a must buy game from anyone, the fact that it is only 800 Microsoft Points (About $10) is an absolute steal. Thank you for reading my review for 5pb and Division 2’s “PHANTOM BREAKER: BATTLE GROUNDS -Cocoa’s Nightmare Attack-” for Xbox Live Arcade! Sayonara! NextI’M NOT DEAD! Why RoKtheReaper.com has been on hiatus.